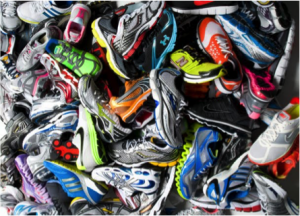 Running Shoes – GET FITTED! Your feet are the foundation of your body. What's on your feet? SHOES! We understand it’s tempting to dust off the vaguely-athletic-looking shoes in your closet, but it’s not a good idea. Worn-out or ill-fitting shoes are a leading cause of injury. And wear and tear are not always apparent to the naked eye. If you want to stay comfortable, healthy, and injury-free, invest in a good pair of running shoes.